Inadvertencies collected from the works of several eminent authors. Stanford Dingley: The Mill House Press, 1963. Number 174 of 'Two hundred numbered copies [...] printed by hand on mould-made paper.' 8vo: [ii] + 9 pp. Stitched pamphlet of twelve leaves, with four vignettes giving it a distinct chap-book feel. COPAC only lists copies at the British Library and Oxford. Prefatory note by 'E. G-H.' [Eddie Gathorne-Hardy]. Double Crown Club Anecdote No. 1. 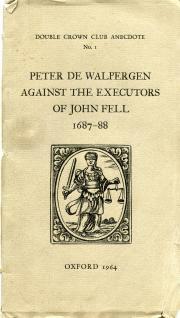 Peter de Walpergen against the Executors of John Fell 1687-88. [Privately printed.] Oxford: 1964. 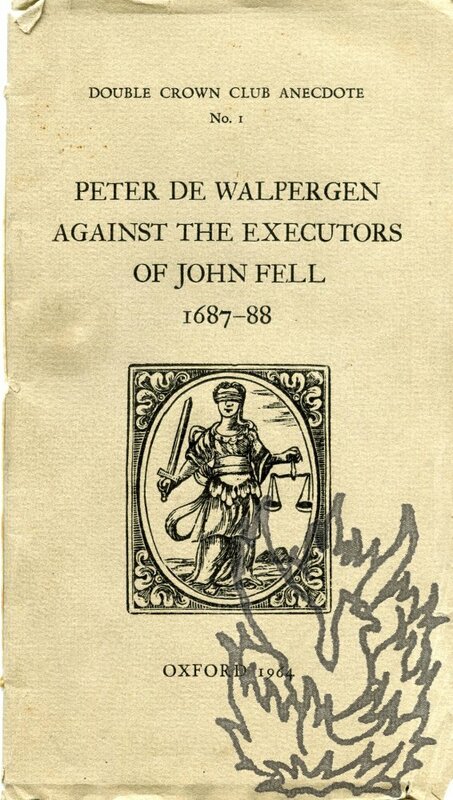 [Printed in the Fell types at the University Press, Oxford by Vivian Ridler, 'and given to the Double Crown Club at Corpus Christi College, Oxford, by Harry Carter 26 June 1964'. 12mo (leaf dimensions): 20 [+ 1] pp. Stitched, and in original grey printed wraps. Internally tight and clean, in creased, worn and spotted wraps with chipping to extremities. Uncommon: the only copies on COPAC at the British Library, National Library of Scotland, Oxford, Cambridge and the V & A. One Autograph Letter Signed to "Gosse" and one Autograph Note Initialled to an unnamed correspondent. The Cayme Press, 21 Stanhope Mews West, Kensington, S.W.7, no dates but the printed address (36 Queen's Gate Mews, S.W.7") has been replaced by handwritten "Stanhope Mews" address. Founder, with Humphrey Toulmin of the Cayme Press. Total 3pp., 8vo, minor defects, good condition, text clear and complete. (The ALS (2pp.) is addressed to [Edmund prob.] "Gosse", inviting him to dinner at the Double Crown Club and thinking he would be amused. "The members are mainly publishers & include such people as Sadleir, Sidgwick, Holbrook Jackson, Harold Monro, Albert Rutherston, Emery Walker & C".